On April 28 2012, it's another historical day for all Malaysians of different races and religions, came together as united in their yellow outfits to protest in a peaceful Bersih 3.0 demonstration, which is also called as the Sit In rally or Duduk Bantah in Malay). According to the internet news, more than 80,000 Malaysians protestors participated in the rally in Kuala Lumpur and some other states in Malaysia. At the same time, more Malaysians from over 70 cities worldwide also participated in Bersih 3.0 rally. Bersih is the Malay word for Clean. 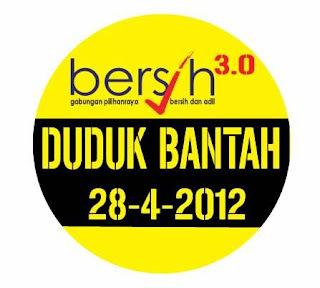 Bersih 3.0 is the 3rd rally after 2011 Bersih rally and 2007 Bersih rally. Malaysians demand for clean and fair electoral poll as well as to protest against Lynas Corporation to cease rare earth project in Kuantan, Malaysia. Apart from that, Malaysians also demand to have the rights to vote while living in overseas countries. To me, Bersih 3.0 rally is a new experience for many of my friends, from young to elderly, who participated for the first time in their lives. They demanded for a reform in government, free from corruption and dirty tactics in politics as well as protested for transparency in electoral poll in Malaysia. Even though most of the protestors were afraid to be brutally attacked by teargas, water cannons and police officers but they still showed their courage to voice out their rights. 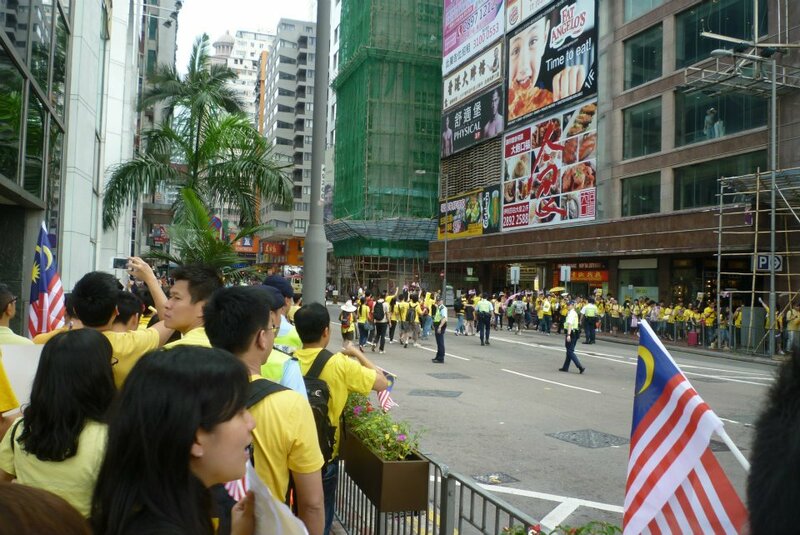 However, the Bersih 3.0 peaceful demonstration in Hong Kong was totally in contrast. I really and highly respect at the Hong Kong police officers. They should be acknowledged and highly praised for their dignity and efficiency in their duties. When the Malaysian organizer arranged for Bersih 3.0 rally in Hong Kong, the police officers were being informed about 100 supporters beforehand but, the crowds turned up to be four times larger than what they were expected on the actual day. Still, the Hong Kong police officers showed their professionalism and were very helpful by deploying more police officers to help out. The Hong Kong police officers also guided our Malaysians supporters and ensured their traffic safety all the way to Consulate General of Malaysia in Wan Chai, Hong Kong before handing over a memorandum. How I wish if our Malaysian police officers, PDRM could learn to be more ethical and professional in their jobs, just like the Hong Kong Police Force. They should have protected the safety of the people rather than acting violently and attacking at unarmed protestors during Bersih 3.0 peaceful demonstration in Malaysia. Pictures tell the story: A video compilation of more than 80,000 Malaysians protestors throughout Malaysia, were united to voice out for fair and clean general election as well as to protest against Lynas Corporation to cease constrution of a factory for rare earth project in Kuantan, Malaysia during Bersih 3.0 rally on April 28, 2012. A video compilation of GLOBAL Bersih 3.0 rally which was held in over 70 cities worldwide and participated by Malaysians in the overseas countries and Malaysia on April 28, 2012. 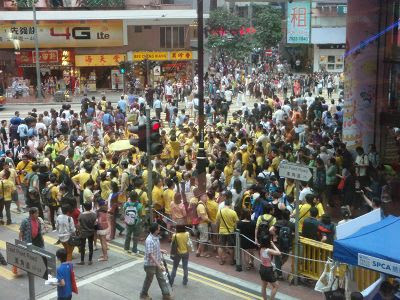 More than 400 Malaysians participated in Bersih 3.0 rally in Hong Kong on April 28, 2012. The peaceful protest received the full cooperation from the Hong Kong Police Force, who had to deploy additional officers to manage the crowds that was four times larger than the officially permitted size. A high praise to Hong Kong Police Force for their dignity and efficiency in their duties. They guided and ensured all these Malaysian protestors to cross the streets safely before reaching Consulate General of Malaysia. The whole journey took about 15 minutes, by foot from Sogo shopping mall in Wan Chai, Hong Kong. Malaysian police have arrested more than 100 protesters involved in one of the largest political protests in the country's history. Riot police in the capital, Kuala Lumpur, fired water cannon and several dozen teargas rounds after protesters demanding electoral reform tried to break through barriers at Merdeka Square, in defiance of a court order. A police spokesman estimated there were about 25,000 demonstrators at the protest, although some Malaysian news organisations put the numbers as high as 100,000. "Look at how many of us there are today – this just proves how sick we are of the corruption of this government," said demonstrator Charles Chan, 33. "The lies and cover-ups have gone on too long. Even if the next government isn't perfect, it will at least be a change – as long as Najib allows Malaysia a clean election." Opposition leader Anwar Ibrahim, who many hope will win the upcoming election, rallied the enthusiastic crowds as one of Bersih's leaders, Ambiga Sreenevasan, said: "We all want change today." Baton-wielding police detained dozens of people, with Malaysian media reports saying as many as 100 were arrested. Video footage by independent news website Malaysiakini showed angry demonstrators overturning a police car that had allegedly hit two people. Several people elsewhere were seen to have fainted, although no serious injuries were immediately reported. Some commentators believe the violence could force the prime minister, Najib Razak, to delay elections that must be held by next March but which could be called as early as June. Najib, whose ruling coalition has held power for nearly 55 years, saw his approval rating fall sharply after the last major electoral reform rally by the Bersih ("Clean") movement in July 2011 when police were accused of a heavy-handed response. The violence on Saturday occurred shortly after a Bersih leader declared the protest a success and asked people to go home. "They [the police] asked the crowd to disperse but did not give enough warning," said Aminah Bakri, 27, with tears streaming down her face from the teargas. "They do not care." Phil Robertson, Human Rights Watch's deputy Asia director, condemned the police crackdown. He said: "By launching a crackdown on peaceful … protesters on the streets of Kuala Lumpur, the Malaysian government is once again showing its contempt for its people's basic rights and freedoms." 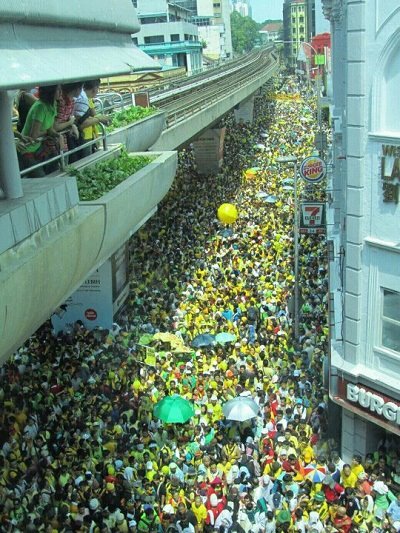 Bersih, an independent movement whose goals are backed by the opposition, has a history of staging influential rallies. Malaysians have demanded more freedoms and democratic rights in the former British colony, which has an authoritarian streak. But despite the huge demonstration , there was no indication that Najib's National Front coalition would agree to meet their demands. "If [elections] are not clean, not fair, show the evidence," Najib was quoted as saying by the national news agency, Bernama, on Saturday. "We do not want to be elected through cheating. We are a government chosen by the people. The majority of the people chose us because they know [we] are better [than the opposition]." Najib has replaced tough security laws – ending indefinite detention without trial – relaxed some media controls, and pushed reforms to the electoral system, which critics have long complained is rigged in the government's favour. But Bersih has complained it is unclear if the steps will be in place for the next election. The government says it has already met, or is addressing, seven of Bersih's eight main proposals for the election, which will introduce the use of indelible ink to cut down on fraud. Bersih says the proposals do not meet most of its key demands, including lengthening the campaign period to at least 21 days from the current seven days and allowing international observers at polling stations. The National Front, which has governed Malaysia since independence from Britain in 1957, suffered its worst performance in 2008 elections, when it lost more than a third of parliament's seats amid public complaints about corruption and racial discrimination. APRIL 29 — Tagged “Hong Kong 3.0 Edition”, the Bersih rally here was an exercise in contrasts. I would not have dared to venture anywhere near Dataran Merdeka had I been home. But there I was with my four-month-old in her baby carrier in the heart of Causeway Bay, Hong Kong’s busy shopping district, an area I would usually avoid because of its thronging crowds. Why did I decide to go? Because I needed to be a part of the movement that might see my Malaysia come to a turning point. I wanted to experience a civil protest, one where I would not have to fear for my life. There must have been about 500 supporters gathered in front of the Sogo department store in Causeway Bay at 2pm. Banners and placards calling for clean and fair elections drew the attention of tourists who took the opportunity to have photos taken with the yellow-shirted supporters. The atmosphere was friendly, like a neighbourhood party as the group of mostly young professionals exchanged hellos and took photos. For some it was a family affair as families took to the streets with strollers and baby slings. A mother of two boys aged eight and 10 decided to stop by en route to a tournament as her elder son had been following the Bersih updates from Kuala Lumpur. He had watched some of it on the telly last year and Wikipedia-ed for more information. Shukri Omar, 56, and his family were in the city for a five-day holiday when they learned of the rally. Their 23-year-old son Ahmad Syauqi was tasked with mapping out the route to Sogo and procuring the Bersih 3.0 T-shirts which they all wore. Shukri was happy to make it to the rally. “I am very proud to see so many young people here. It is a good sign. A good beginning,” said Shukri, who is from Shah Alam. A group of 30 Malaysians residing in China made their way from Guangdong, Dongguan, Zhongshan and Shenzhen to show their support. “We might not be in Malaysia but our heart is still in Malaysia. We love Malaysia. We want our votes to count. We want a legitimate government,” said one supporter. When the “NegaraKu” was sung, the crowd stood at attention and sang with pride. The national anthem was sung thrice, along with “Setia” and “Ubah”. The true stars of the afternoon were the Hong Kong police who performed an excellent job keeping our group in order. Only five officers were seen at any one time but an officer I spoke to said about 50 policemen had been deployed. Their main task was traffic control as we made our way on foot to the Malaysian Consulate in Wan Chai, which is a 15-minute journey. It seemed like they were protecting us from being run down more than anything else. We managed to hand over a memorandum demanding free and fair elections to the vice consular general. The turnout had exceeded expectations. The organising committee of today’s rally had expected 100 people when it applied for a police permit two weeks ago, said organising committee member Brendon Tam, 36. Last year, 80 people showed up. We had the weather on our side. We had the police on our side. We had a strong show of solidarity. It was a good day for Malaysians in Hong Kong. And in true Malaysian style, the rally ended with makan at the Cinta-J restaurant located behind the Consulate. Police form barricades at the Bersih rally calling for greater electoral transparency on Saturday, April 28. Two days after Malaysian riot police used tear gas and water cannons to disperse approximately 50, 000 demonstrators rallying for electoral reform, political opponents in the country—preparing for a crucial election that could be called as early as June—are locked in argument over who is to blame for the violence. Saturday’s rally, the third organized by Malaysia’s Bersih group, was already slated to be a tense confrontation between Prime Minister Najib’s coalition and the broadly antigovernment demonstrators seeking “free and fair elections,” including allowing overseas Malaysians to vote. In days leading up to the rally, the group pushed for their gathering to be held at the historical Merdeka Square, despite repeated police and government warnings to keep away from the area. On Saturday, riot police barricaded the Square, pushing back against demonstrators who dismantled some of the barriers. Police officials have said the police action was only taken once the barricades were breached. Government officials have played down the severity and extent of the violence involved in Saturday’s protest, with opposition voices jumping on the occasion to widely condemn what they say is a sign that Mr. Najib’s government remains heavy-handed in response to civil dissatisfaction. “A group of protesters tried to provoke a violent confrontation with the police, but overall at this stage it would seem this afternoon’s protest passed off without major incident,” said Minister of Home Affairs Hishammudin Hussein on Saturday evening. Bersih protestors at a mass rally calling for more transparency in elections in Kuala Lumpur on April 28. “Despite opposition claims to the contrary, the government fully respects peoples’ right to peaceful protest, which is enshrined under Malaysian law,” he continued. Bersih leaders say the violence started only after police action and that their intention was for a peaceful rally. “[Malaysians] did not come there for violence. All purported acts of violence took place only after the tear gas was fired,” said Ambiga Sreenevasan, one of the co-founders of the Bersih group, in a news conference after the rally. “There ought to be an independent inquiry in relations to [the way police handled the rally] – it must be absolutely impartial,” said South Australian Senator Nicholas Xenophon, who is part of a an international fact-finding mission on Malaysia’s elections. Opposition leaders have also called for an independent inquiry into Saturday’s police action, but some government voices have blamed Mr. Anwar for the provocation—saying it was the opposition that pushed the protesters to move into Merdeka Square. Multiple videos posted on YouTube show opposition leaders signaling hand gestures that could be read as calls to break the barricades, though Mr. Anwar and his deputy Azmin Ali deny this, and say they were telling protesters to disperse. Looming over the event is an election that has to be called before 2013 but will likely be much sooner. Analysts say questions arising from this weekend’s protest could hurt the credibility of both Mr. Najib’s ruling Barisan Nasional, which is seen as heavy-handed and disproportionate even after implementing reforms, and equally, the opposition, which is seen as irresponsible and provocative. In comments to the press, Mr. Najib said that the police were the “victims” of the rally’s violence, rather than the protesters or observers at the rally. Analysts say that Mr. Najib may still choose to call elections early, emerging from this Bersih chapter relatively unscathed. A similar rally last year was markedly more violent, with the detention of more than 1,600 members of Bersih. International condemnation of that police action prompted Mr. Najib to enact a series of political reforms, including repealing the Internal Security Act. But economists, too, say they would rather see an election sooner than later. Economists from the World Bank’s Malaysia branch have raised their concern over the uncertain timing of the elections, a process that they say could upset investor confidence and delay legislation needed for further economic growth. Malaysian Prime Minister Najib Razak will decide whether to proceed with early elections after police clashed with demonstrators seeking faster and more radical changes to the country’s voting rules. 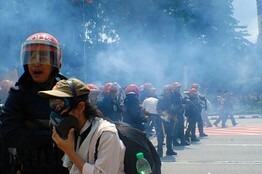 Police fired tear gas and fought with protesters in Kuala Lumpur as they marched at the weekend calling for “reform” and cleaner elections. All 512 people, arrested for defying a new government ban on street rallies, were later released, Assistant Commissioner of Police Ramli Mohamed Yoosuf said by phone, estimating the crowd size at between 40,000 and 50,000 people. Preparations for an election have begun, Najib said in December. His ruling National Front coalition, which has governed Southeast Asia’s third-biggest economy for five decades, may call a vote as early as May or June, according to four officials who spoke last month. The poll required by early next year comes in the face of decelerating growth and a resurgent opposition led by Anwar Ibrahim. Najib told the official Bernama news services yesterday that he didn’t know whether the protest might delay Malaysia’s 13th general election and expressed regret that violence occurred. Gross domestic product growth may ease to 4 percent this year from 5.1 percent in 2011 on a weak global outlook, slower than regional rivals Indonesia, Thailand and Vietnam, according to the Asian Development Bank. While the FTSE Bursa Malaysia KLCI Index hit a record on April 3, its 2.6 percent gain this year lags benchmarks in neighboring countries. Police used water cannons as some marchers threw shoes, bottles and chairs while trying to break through barricades to enter a square where the Coalition for Clean and Fair Elections, or Bersih, wanted to hold a sit-in. Najib’s government enacted legislation this month banning such protests after police detained more than 1,600 people during a similar rally in July. More than 250,000 people attended the protest, Bersih co-chairwoman Ambiga Sreenevasan was quoted as saying by the Malaysiakini news portal yesterday, dismissing the police figure as too low. The ringgit halted four days of gains to drop 0.2 percent to 3.0262 per dollar in Kuala Lumpur today, according to data compiled by Bloomberg. Malaysia’s benchmark stock index closed 0.2 percent higher. Arrests during last year’s rally led to a temporary drop in the prime minister’s approval rating. A delayed vote would prevent him from taking advantage of a swell in support that followed increases to civil servant salaries and cash payments to poor households. The government can’t understand why the demonstration was necessary as seven out of the movement’s eight demands have already been addressed, Home Minister Hishammuddin Hussein said in an e-mailed statement after the rally. Indelible ink has been introduced to stop people voting twice, the electoral roll has been “thoroughly scrutinized”and the election campaign period extended to a minimum 10 days, the minister said. Bersih, whose name means “clean” in the Malay language, is demanding that Election Commission officials resign after so far implementing just one of its demands, the use of indelible ink, in time for the next vote, Ambiga said April 24. The group also wants it to introduce absentee ballots, a minimum 21-day campaign period and more comprehensive review of the electoral roll to remove dead people and duplicate voters. Najib’s approval rating in peninsular Malaysia fell to a two-year low of 59 percent a month after last year’s protests, according to the Merdeka Center for Opinion Research. It increased to 69 percent in February after the government announced it would give cash handouts of 500 ringgit ($164) to households with monthly incomes of 3,000 ringgit or less, and overhaul security laws. The margin of error was 3.07 percent. In 2008, when eight days of campaigning preceded elections, Najib’s National Front coalition won by the narrowest margin since independence in 1957. A Bersih rally held three months before that vote increased momentum for the opposition, according to Joseph Chinyong Liow, associate dean of the S. Rajaratnam School of International Studies in Singapore. While barring street protests, Malaysia’s Peaceful Assembly Act enacted this month still allows gatherings elsewhere if organizers give police 10 days’ notice. The authorities said they offered Bersih organizers the use of several stadiums around Kuala Lumpur for their weekend protest, though Ambiga claimed this came too late. Police began cordoning off Kuala Lumpur’s Independence Square on April 27 after getting a court order preventing people from entering the area where Bersih planned a sit-in. Crowds marched in groups toward the square from different parts of the city, including the 88-floor Petronas Twin Towers, Southeast Asia’s tallest building. Some 13 police officers were hospitalized, Ismail said. At least 117 rally-goers were treated, according to cases reported to Bersih, steering committee member Maria Chin Abdullah, said in a text message to Bloomberg today.